So, how busy am I? 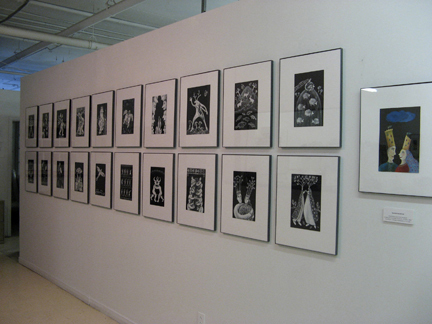 My show, Maisons modèles, opened at the Maison de la culture du Plateau-Mont-Royal on January 29. For more info on that you can read the article in Le Plateau. 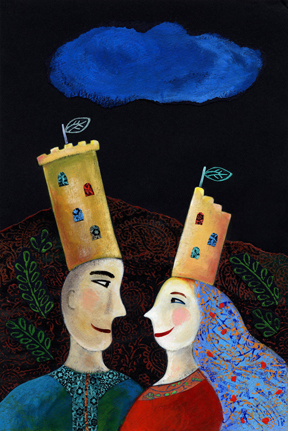 My exhibit of illustrations from Tork Angegh opened at Atelier Circulaire on February 8. 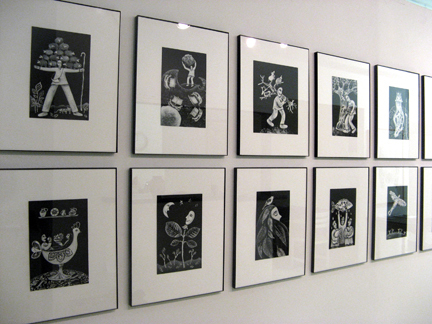 On March 3, my show, Animal Instincts, will open at Atelier-galerie Alain Piroir. Whenever I get tempted to feel a hint overwhelmed I think of women who have three children in a row…or triplets! Then I realize that this is a relative breeze. I can have three shows in a row, bang, bang, bang. At least I don’t have to feed, burp, and diaper my artwork and at the end of my busy day I go to bed and sleep peacefully the whole night through! Speaking of kids, on Sunday, my son, Pablo, came to Atelier Circulaire to help me hang the illustration show. We lugged 21 framed pieces from the car to the fifth floor of 5445 de Gaspé Avenue. Fellow artist, Wing, was quick to suggest stretching string across the wall as a guide for our nails. When I hear good advice I follow it. At one point I sat down while Pablo hammered the two rows of nails. Just then Stella passed by and said that I looked like a queen. At that moment I did feel quite regal, almost as regal as Haykanush on her wedding day. If you want to see what she wore on the day of her marriage to Tork Angegh, you have to come to Atelier Circulaire and see for yourself in the final image in this perfectly hung sequence of illustrations! Whenever I sit at the kitchen table I can see and contemplate my exhibition. I feel a sense of pride and also a sense of relief that I got through that challenging, stimulating, yet at times arduous project. Stella, Wing, and Roberto suggested that I use the showcase on the ground floor to advertise my show. When I was little I used to think that it would be cool to be a window dresser. I told Wing I could display my book in the showcase with a bottle of expensive wine or maybe some plastic sushi to lure people up to the fifth floor studio. The promise of food and drink always works. Then I thought of changing the display every day. My final idea was to stand in there for a whole day in a fancy evening gown showing my book the way the gals would show off prizes on The Price is Right. I saw a Ritzy version of that trick in a New York jewelry shop on Fifth Avenue. I don’t know where they found that stunning, blonde woman. She was a real head-turner in that long, black gown and that glittering diamond choker as she leaned against a shiny grand piano. For now, I have a copy of Tork Angegh in the window…and this blog to attract visitors to the show. On a more mundane note, these days it’s quite easy to find parking spots around Atelier Circulaire. O.K. I’m feeling generous–on Henri-Julien, between Laurier and Maguire. Between April 1 and December 1, when parking bylaws become stricter, it is not unusual to circle the area for up to 20 minutes before parking and finally feeling the bliss of pavement beneath your feet. This morning I literally had a choice of three parking spots. I had the luxury of choosing the big one, on the left, perfectly shoveled by an unknown citizen of Mile End. I thought to myself, parking these days is so easy it’s not even fun anymore. The intensity of the challenge equals the intensity of pleasure when that challenge has been met. The point being, when my third show opens on March 3, I should be flying pretty high. Come check out my flight pattern. In the meantime, you have two other shows to choose from. L’embarras du choix, which translates into a strange expression I have never heard–embarrassment of riches. 20 requêtes. 0, 120 secondes.